When it comes to holiday foods, my family is all about tradition. Year after year, the same foods appear on our tables and in our homes throughout the Thanksgiving and Christmas holiday season. When I first began cooking for a living...going to school, cooking in an exciting restaurant kitchen...this bothered me a lot. I found it to be constraining...and a bit boring. I wanted to prepare exotic and different foods from other traditions. Unfortunately, my desires didn't mesh very well with those of my family. 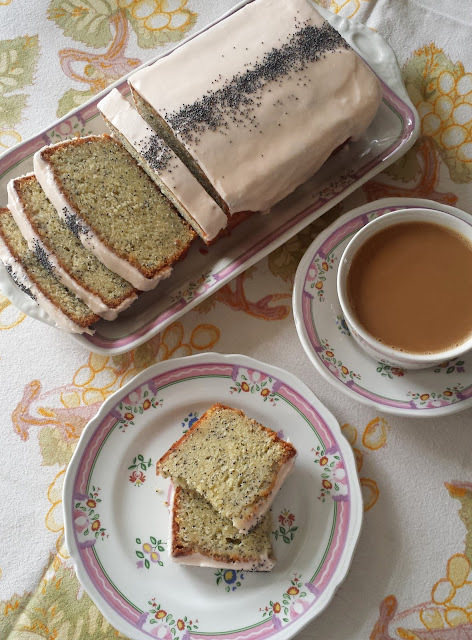 But of course, the holidays really are about family: remembering the things that connect us to each other and to those who are no longer physically present. Food...and the traditions that surround it...are a beautiful and symbolic part of this. Every year we serve a sweet Wassail on Christmas Eve at a simple family gathering in my home. Everyone expects it. To be honest, I don't like it very much. But my father loved it...and he loved Christmas. So I am happy to make it every year because it reminds me of him and the joy he found in the holiday season. And now, a new generation has apparently acquired a taste for it: I found out a few years ago that my niece loves it. So... the tradition will continue. 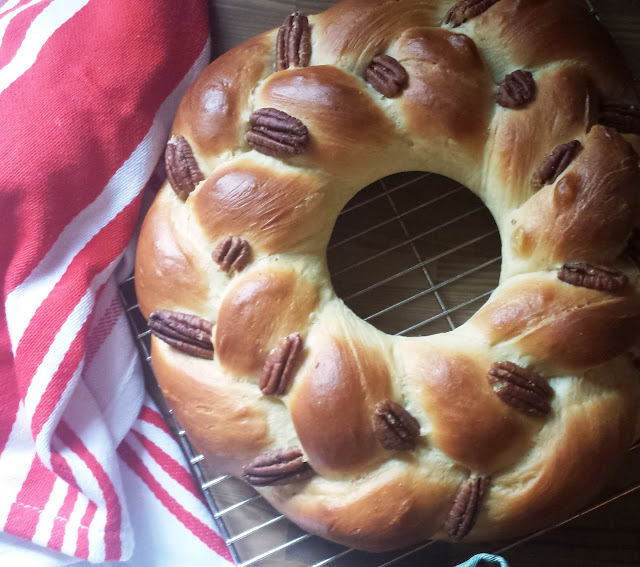 I have of course introduced a few new food traditions of my own into the mix. The holiday wreath coffeecake I make now for Christmas breakfast was something I started making a few years ago...and it has gone over well. It is, I think, here to stay. 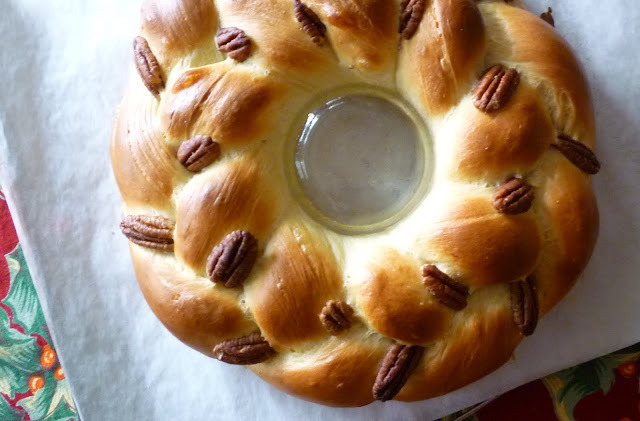 Other traditional family foods have received a bit of a makeover: artisanal bread (instead of Wonder bread) in my Grandmother's sage dressing....homemade sour cherry compote (instead of canned pie filling) in a favorite family coffeecake.... But some recipes really didn't need to be changed at all. They were already delicious...and part of the things I have loved about our family's holiday traditions. The recipe I'm sharing today is one of these. I don't know at what point a particular dish had to first appear on our table in order for it to become a settled family tradition...but it probably had to be sometime before all of the kids had graduated from college. (I think a lot of traditions are rooted in the fact that we all want to be kids again at Christmas...) The bread I'm posting today appeared in Better Homes & Gardens magazine in December of 1982, so it's on the fringe in terms of time frame (two of the four of us were in college at that time). But I'm glad it made the cut—it's a tradition that I happen to like. I have not changed this loaf from the original (other than to stream line the method a bit). Simple, festive and delicious as is—it is similar to the soft and slightly sweet homemade dinner rolls that everyone loves to have on their tables at the holidays. It is the perfect accompaniment to the bowl of Cream of Wild Rice Soup that we always have for our Christmas Eve dinner (a tradition dating from our Minnesota days in the mid-70's). In recent years I guess you could say that I have gone from tolerating these family food traditions to enjoying them. I am blessed that my work provides a creative outlet for me as I prepare a wide variety of interesting and different things for my clients. In the hurry and rush of the season, it is frankly a relief to not have to think about what I'll prepare for dinner on Christmas Eve. And then, sitting down to that simple and familiar bowl of soup with bread (before the rest of the family arrives for the Wassail and other traditional holiday treats), I get to have a quiet moment to truly enjoy the current season...and at the same time savor the memories of the many Christmases that have passed. Scald the milk. Place the butter in a medium-sized mixing bowl. Pour the hot milk over the butter. By the time the butter melts the temperature of the milk should be about 105° to 115° F.—if not, let it sit until it is. Add the yeast. Stir until dissolved. Whisk in the sugar, salt and egg. Add a cup of the flour and whisk until smooth. Stir in another 1 1/2 cups of flour, adding as much of the remaining half cup necessary to obtain a soft, shaggy dough. Turn out, scraping the bowl well, onto a lightly floured surface and knead, adding only as much of the remaining flour as you need to manage the dough—it will remain a bit sticky, but will eventually become smooth and elastic. This will take about 7 to 10 minutes. 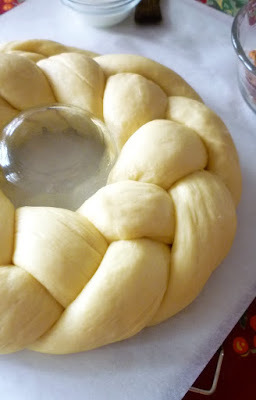 Place the dough in a buttered bowl and turn to coat. Cover with plastic wrap and set in a warm spot. Let rise until doubled in bulk—about an hour to an hour and a half. 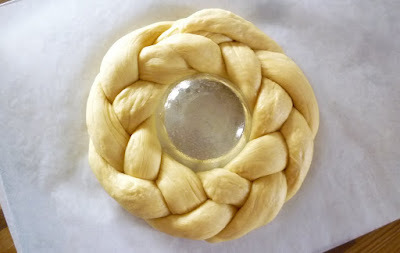 Knock back the risen dough, turn out onto your work surface and divide into three equal balls. Cover with a towel and let rest for 10 to 15 minutes. 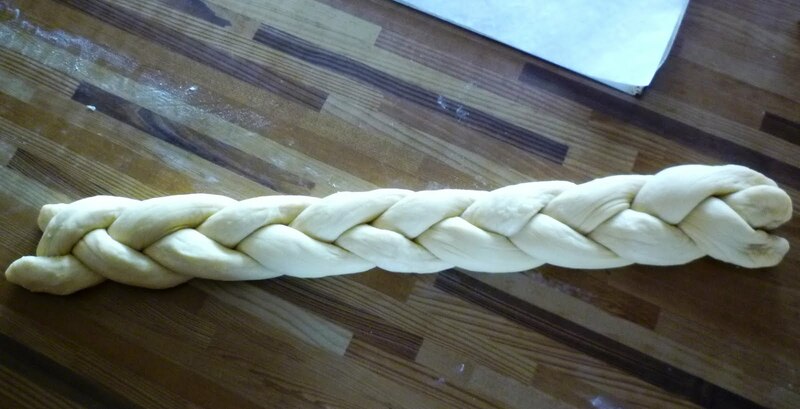 Roll each ball into a 24-inch rope....using very small amount of flour only if necessary to keep the ropes from sticking unmanageably. and wrap around the custard cup, pinching the ends together to seal and form a continuous braid. and if you touch it gently with your fingertip, the indentation will remain—about an hour. 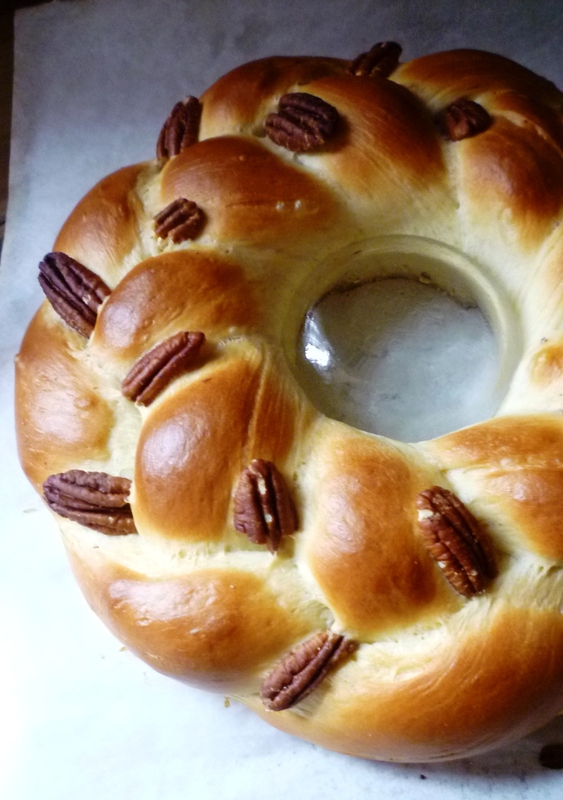 Carefully brush the loaf with milk and tuck the pecan halves decoratively into the crevices of the braid. Bake in a 375° oven until golden brown—if you tap on the loaf it will sound hollow—20 minutes or so. Transfer to a wire rack. When the loaf is cool enough to handle, lift it off of the custard cup and serve.